text in Spanish. 32pp illustrated in b/w. Playing Cards & Gambling Memorabilia at Auction. The Leonard Schneir Collection. text in English. 60pp. fully illustrated in colour. A Supplement to the Catalogue of the Cary Collection of Playing Cards: Preliminary Descriptions. Playing-cards of the world: Catalogue of the collection of the Worshipful Company of Makers of Playing Cards and cards owned by Guildhall Library, City of London, where the collection has been deposited since the initial donation in 1908 by Henry Druitt Phillips. The Waddington Playing-Card Collection : Catalogue of the Waddington deposit at Guildhall Library, London, Part 2.
text in German. 25 p. + 16 b/w pl. Diputación Foral de Álava, Vitoria-Gasteiz, 1994.
text in Spanish. 162pp most items illustrated in b/w. text in Spanish. 20pp including many b/w illustrations. text in German. 39pp. illustrated. text in German. 90pp including 17 b/w plates. text in English. 128pp, well illustrated in b/w & colour. text in German. 156pp well illustrated in colour. Deutsche Spielkarten 1650-1900: Katalog der Spielkarten mit deutschen Farben in der Sammlung des Germanischen Nationalmuseums. Playing Cards of various Ages and Countries: Selected from the Collection of Lady Charlotte Schreiber. Volume I. English, Scottish, Dutch and Flemish. Playing Cards of various Ages and Countries: Selected from the Collection of Lady Charlotte Schreiber. Volume II. French and German. Playing Cards of various Ages and Countries: Selected from the Collection of Lady Charlotte Schreiber. Volume III. Swiss, Swedish, Russian, Polish, Italian, Spanish and Portuguese, with a supplement of other countries. text in Spanish with parallel supplements in English and Basque. This is a history of the Fournier collection. First published in 1876 with a `Supplementary Portion' dated 1877. Deutsche Bilder - Deutsche Farben. Spielkarten Ausstellung, Heimatmuseum Prien am Chiemsee. text in German. 47pp, illustrated. State Hermitage Museum, St. Petersburg, 1992.
text in English. 10pp. including 2 colour plates and 1 double b/w plate. text in German. 11pp + 23 plates. The State Museum-Preserve Peterhof. Playing cards: the collection of Alexander Perelman. New accessions 2000-02. The Story of the Playing Card. Hand-out at Summer Exhibition 1985, University of Reading Library. text in English. 12pp. illustrated. Balan, E.-H., Börner, H., Radau, S., and Schlede, S.
Un donateur - une collection. Cartes à jouer du XVIe au XXe siècle. Berti, Giordano & Vitali, Andrea (editors) et al. text in Italian. 234pp illustrated. text in German. 94 pp. Mit offenen Karten : alte Spielkarten aus dem Augustinermuseum in Freiburg und aus Privatsammlungen. text in Dutch with summaries of last two chapters in English and French. text in Dutch and French. 160pp. Fully illustrated. text in Dutch. 32pp. illustrated. text in Dutch. 40pp. illustrated. text in Dutch. 33pp. illustrated. De passie van een verzamelaar. De collectie Robert van Gool. text in Dutch and French. 36pp. illustrated. text in Dutch. 72pp. illustrated. text in Dutch. 31pp. illustrated. text in Dutch. 62pp. illustrated. Les Cartes de la Révolution. Cartes à Jouer et Propagande. Fiorin, Alberto & Pedrocco, Filippo, et.al. text in French and German. 47pp unillustrated. text in German. 20pp 4 plates. text in Spanish. 21pp. illustrated. text in German. Illustrated in b/w and colour. Hamburgische Spielkarten. A catalogue of playing-cards produced in Hamburg. text in German. 71pp fully illustrated in b/w & colour. text in German. 52pp (22 plates). text in German. 50pp, illustrated. Karten zum Zaubern. A catalog of cards for conjuring. text in German. 212pp, profusely illustrated in b/w & colour. text in German. 228pp illustrated in b/w + 16 colour plates. text in Hungarian, summaries in English, German, French. 36pp. illustrated. text in Hungarian and German. 32pp including 19 colour plates. text in Danish and English. Fully illustrated. text in German. 12pp, illustrated. Kopp, Peter F. and Eberhard, Balz et al. text in French. 44pp illustrated in colour. text in French. 8pp. illustrated. text in Italian. 37pp + 19 plates. Come Giocavamo. Giochi e giocattoli, 1750/1960. text in Italian. Includes section on playing-cards. text in French. 160pp + 18 plates. text in Dutch with English summary. text in French. 43pp of entries, few illustrations. Donation Camoin et Cie. Exposition du Tarot de Marseille. text in French. Illustrated. Covers other cards as well as tarot. Sénépart, Ingrid (editor) with texts by Joseph Billioud, Thierry Depaulis, Dominique Samanni, Jean-Pierre Seguin, Ingrid Sénépart, etc. Hraci karty v Praze. Karty a kartari v Praze 16-20 stoleti. An exhibition of playing-cards produced by cardmakers from Prague. text in Czech, with summary in German. text in German. 55pp with photocopy illustrations. Tarockanische Spiele. Wiener Spielkarten und ihre Hersteller. 73.Sonderaustellung des Historischen Museums der Stadt Wien, im Otto-Wagner-Pavillon, Karlsplatz. Museen der Stadt Wien, Vienna, 1981.
text in German. Folded sheet, illustrated, Ditha Moser tarot on reverse. Wiener Kartenmacher des 19. Jahrhunderts. A list of cardmakers in Vienna and dates as taken from address books. text in English (also issued in other languages). 152pp. Good illustrations. text in English. vi, 87 pp. De Brugse drukkerfamilie / Prestigieuse famille d'imprimeurs de Bruges / The printer's family of Bruges : Daveluy, Brugge's trots en koninkijke troef / prestige de Bruges & atout royal / Brugespride & a royal trump. text in Dutch with summaries in French and English, 176 pp., many colour ill.
text in German with synopses in English and French. Braun, Cologne, 1989, 2nd edition 2000.
text in Germany with synopses in English and French. text in German. 156 pp. text in German. 134 pp. Facsimile of a handwritten list of cardmakers. text in French. 63 pp. text in French, 27 pp. text in French. 38pp. 5 plates. text in Spanish. 2 vols. text in Spanish, 59 pp. text in Spanish. 27 pp. text in Spanish, Basque, French, English. text in Danish with English summary. text in English. 24pp, illustrated. text in German. 132pp fully illustrated in b/w & colour. Imprimerie Joseph Allier, Grenoble, 1887. Recherches sur les cartes a jouer et sur leur fabrication en Belgique depuis l'annee 1379 jusqu'a la fin du XVIIIe siecle. text in French. 53pp. Unillustrated. text in German. 200 pp. Ragg, Ernst R. et al. text in German. 62pp illustrated. text in Swedish. 13pp. illustrated. text in German. 122 pp. text in Catalan, Spanish, French and English. Thorpe, John G. & Goodall, Michael H.
text in English. 76 pp. text (names of countries only) in Dutch. text in German. 38pp (illustrated). Lists cardmakers in Freistadt, Linz, Ried im Innkreis, Steyr, Wels. text in German. 130 pp. text in English. 57pp, useful illustrations. text in English. 32pp, useful illustrations. Berkel, Nico Peters van, and Haleber, Bob C. T.
text in Dutch. 144pp. Well illustrated. text in German. 136pp + 14 loose plates. text in Italian. 160pp, well illustrated. text in English. 35 figs. text in French. 2pp. illustrated. text in English, 600 pp, 36 b/w plates. text in German. 311pp illustrations of all cards from 3 packs. Cartes à Jouer & Philatélie. Répertoire. text in French. 16pp. illustrated. E. & G. Goldsmid, Edinburgh, 1886.
text in German. 88pp. Illustrations as in Spielkarten aus aller Welt. text in English. 200pp largely unillustrated. Die Welt der Spielkarte/The Playing Card. An Illustrated History. Gemalte Spielkarten. Eine kleine Geschichte der Spielkarte. text in German. 158pp, well illustrated. text in Dutch, English summary. 356 pages, profusely illustrated. text in English. No illustrations. text in English. 64pp. some illustrations. 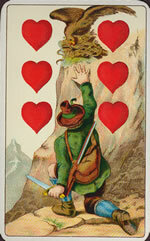 Old Playing-Cards from the Fifteenth to the Nineteenth Century. text in English. 83pp illustrated in gaudy colours. text in English. 83pp illustrated in b/w. text in Italian. 16pp, well illustrated. On the relation between Portuguese and Japanese cards. The Map Collectors' Circle, London, 1972.
text in French. 6 plates. text in English. 10pp + 57 figs + frontispiece & 5 plates in colour. Das Stuttgarter Kartenspiel. The Stuttgart Playing Cards. text in German and English. 168pp, all cards fully illustrated. text in English. 392pp. unillustrated. text in German. 35 figs. In 'Thuringische Studien, Festschrift fur Feier des 250-jahrigen Bestehens der Thuringischen Landes-bibliothek Altenburg", pp.122-133 and figs 1-29, Altenburg, 1936. Le jeu de cartes Mongol & A propos du chamanisme Mongol. text in French. 16pp. with figs. text in German. 2 figs. text in German. 8 figs. Wann und wo wurde die Holzschnitt erfunden? text in German. 14 figs. text in German. Unillustrated. Bibliography with 95 entries. text in German. 51pp including 36 plates. text in German. 16 figs, plus diagrams. text in German. 182pp, well illustrated. text in French. 345pp Well illustrated. Taylor, The Reverend Ed. S.
The Devil's Picture Books, A History of Playing Cards. text in French, English & Italian. text in English. 75pp, all cards illustrated. text in English. 41pp illustrated. Yale University Library, Yale, 1973.
text in Hungarian. 128pp, well illustrated. text in German and English (shortened). 20pp. 19 illustrations. text in Dutch and English. 88pp, mostly illustrations. L'Imagerie du Diable. 600 Ans en Belgique. A comprehensive description of standard American and Canadian cards and makers, with each pack illustrated. text in English, 324 pages, lavishly illustrated in b & w, 24 pp. colour illustrations. "On Some Old Playing-Cards Found in Trinity College" in Proceedings of the Cambridge Antiquarian Society, No. XLVII (number 3 of the 11th volume, 5th volume of the new series), pages 454-464, given on Monday 19 February 1906. "More Old Playing Cards Found in Cambridge" in Proceedings of the Cambridge Antiquarian Society, No. LXVI (the 18th volume or 12th volume of the new series), pages 14-25, given on 23 April 1913. "Cartes à Jouer Parisiennes du XVIe Siècle (suite)"
in Nouvelles de l'Estampe No. 123, July 1992, pp. 32-37. Les Guymier, cartiers parisiens du XVIe siècle. text in French. 20pp. 15 illustrations. text in French. lxvii, 128 pp. text in German. 34pp, including 47 b/w figures. A catalogue of cards produced in Berlin. A catalogue of Leipzig cardmakers. text in Icelandic, concise summary in English. text in German. 160pp well illustrated in b/w. text in Italian. 91 pp. Hyakunin isshu. Hundert Gedichte von hundert Dichtern. text in German. 219pp. All 200 cards of rare pack illustrated. text in Japanese. 152pp well illustrated. text in Japanese. 261pp, illustrated in b/w & colour. text in Japanese, beautifully illustrated. Berkel, Nico van, et al. text in Dutch; English translation issued in 1988.
text in English. 44pp fully illustrated. text in Dutch. (Pages not numbered) Fully illustrated in b/w. text in Norwegian with brief summary in English. text in Portuguese. 23 p.
text in Portuguese. 27 p.
in La Sota, No. 8, Feb. 1993, pp. 3-50. Garcia Martin, Enrique (Ed.) et al. text in Spanish. 340pp (mostly illustrations). text in German. 88 pp. Museum zu Allerheiligen und Cartophilia Helvetica, Schaffhausen, 1998.
text in German. 147 pages, illustrated in colour & b/w. Kartenspiele und Spielkarten in der Schweiz. text in English. 201pp fully illustrated in b/w. text in English. 12pp fully illustrated in b/w. Description of (modern) cards designed by artists. text in German. 177pp, many illustrations. A description of hand-painted playing-cards. text in German. 123 pp., over 100 ill.
text in English. 9pp. unillustrated. A description of cards with motifs from mining. text in English. 83pp fully illustrated in b/w. text in Italian. 489pp, few illustrations. text in English. 240pp, some illustrations. The Tarot Cards Painted by Bonifacio Bembo for the Visconti-Sforza Family. An Iconographic and Historical Study by Gertrude Moakley. text in German. 5 vols. (1996) + vol. 6 (1999). Sturzenegger Stiftung Schaffhausen / Museum zu Allerheiligen Schaffhausen, Schaffhausen, 2004.
text in German, French and English. English and French summaries. text in Dutch. 14pp. illustrated. text in Italian. 158pp illustrated. text in English (translated from Italian). text in English. 191pp well illustrated in b/w & colour. text in English. 308 pp. 16 pp. of black & white illustrations. text in English. 249pp. drawings from Sheridan Tarot. text in Spanish. 15pp. illustrated in colour. Recommended by Frank Jensen as an example of contemporary intelligent tarot literature. The Cards Can't Lie. Prophetic, Educational & Playing-Cards. text in English. 127pp b/w illustrations. No text, captions in English. Fully illustrated. text in Danish. 24pp illustrated. Court de Gebelin. Le Tarot (reproducing part of Le Monde Primitif). text in French. 195pp, some illustrations. text in English. 127pp. diagrams. text in Hungarian. 87pp with 23 colour illustrations. text in English. 176pp well illustrated. The Tarot Trumps. Cosmos in Miniature. text in English. 134pp illustrated. text in German. 48 pp. text in German, introduction also in English. 40pp fully illustrated in b/w. Wood-block and stencil: a survey of English card-makers and their wood-block cards: a classification of their distinctive features with a particular focus on the period 1790-1830.
text in English, 121 pages. 24pp including 10 figs, + 4 double-page plates excellent plates, faulty history. Deutschen Spielkarten #1. Made by Dondorf.